The new functionality implemented in Version 5 allows Users to easily create a statistical model to find anomalies in data containing a large number of dimension values. This process can surface specific anomalies across thousand of records and dimensions, allowing reports and metrics to be easily created with this reduced information. 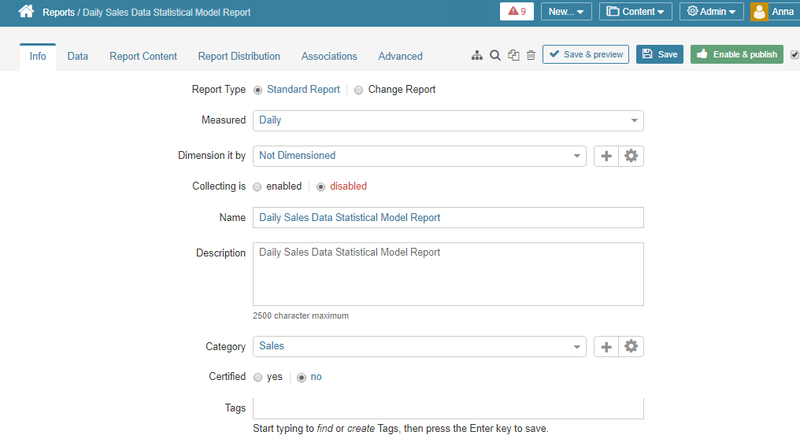 For an example, we will create a Stats Model from an existing Dataset containing Sales data from our test database. We want to find any values of 'Cost of Product', 'Sales Amount' or 'Gross Profit' that fall outside of 2 standard deviations from a 30-day moving average. We want to perform this evaluation across these dimensions: Country, Channel, and Product sub-category. Name - default is 'Statistical Model' appended to your Dataset Name - Name may be modified. Date column - choose a Date from the Results field or use 'Snapshot Date' if your Dataset is snapshotted. Moving Average Interval - select a moving average range that will produce statistically relevant data. Upper and Lower Control Limits provide calculations used in I-MR statistics. Provide the multiplier used to generate upper and lower control boundaries. The generated Stats Model returns only records that fall outside of a specified number of standard deviations. Lower numbers will include more results, higher numbers fewer records but significantly anomalous results. Set your Volatility limit to control the number of records returned in your stats model. You can compute volatility for the either the current(latest) Calendar date or for all Calendar values. Dimensions - We have selected 3 filters. We have also selected Include Totals for each dimension to generate stats for every unique combination of filter values against all other filter values including aggregated totals. In this example, a Total value will be calculated for All Countries, All Channels, All Product-subcategories, as well as all channels and products for each country, all countries and products for each channel, etc. If you have checked #4, you may elect to alternately display one row for each separate measure with an anomaly instead of concatenating. For details on creating elements from Statistical Datasets refer to this article for more information: Sourcing Reports / Metrics / Dimensions from "Existing Datasets - SQL"